The seventh season of The X-Files seems to unfold in limbo. It takes place in a weird dreamscape, where the show is neither entirely dead nor alive. It feels like the show has broken free of a lot of the weight that it built up over the previous six years, but is not entirely ready to move along. There is a sense that this might just be the final season of the show, but a reluctance to thoroughly commit to that idea. Although the show hints towards resolution, it commits to as few definitive answers as possible. The revelations concerning the fate of Samantha Mulder in Sein und Zeit and Closure represent perhaps the season’s most definitive resolution of an long-running plot point. Mulder and Scully kissed in Millennium and seem to have slept together in all things, but it has hard to figure out where exactly their relationship is at this juncture. Despite the collapse of the Syndicate in One Son, the Cigarette-Smoking Man seemed to hold control over something resembling the conspiracy in The Sixth Extinction II: Amor Fati and En Ami. Of course, the reasons for this ambiguity are quite obvious. While there was every possibility that the seventh season of The X-Files might be the final season of the show, there was also every possibility that it might also get a last-minute renewal. Certainly, Fox were eager to hold on to the series. Malcolm in the Middle had been the network’s only big new success of this disastrous television season, meaning they weren’t in a position to sacrifice a piece as valuable as The X-Files. Even if the value of The X-Files had been somewhat diminished. However, there was a sense that The X-Files was largely spent. Chris Carter had already extended the show well beyond the initially five-season target towards which he had aspired. Indeed, the episode’s first act features Mulder and Scully defending their work from an external arbitrator who is wondering whether they have already accomplished everything that they had intended to do. It is telling that this is the same narrative role that Chris Carter had occupied during his cameo in Anasazi at the end of the show’s second season. Special Agent Chesty Short points out that Mulder and Scully are really at a point where they should wrapping things up. He draws attention to the department’s focus on “investigating [Mulder’s] sister’s abduction and the government conspiracy around it. Both of which have been resolved, correct?” Of course, the show never gave the impression that Samantha Mulder’s abduction was a priority for the FBI, but it was one of the core mysteries of the show. The fact that the mystery was closed perhaps indicates that it is time to move on. Of course, Mulder rather wryly responds, “Nothing has been resolved exactly.” It is a delightfully wry observation on the part of Chris Carter, a writer who always felt more comfortable asking questions rather than answering them. The production team are under no illusions about the weird state of the seventh season as a whole, how the show’s ambiguous state has forced the writers to carefully balance any closure they might attempt to offer the audience. It is also, perhaps, an acknowledgement that The X-Files is not great at endings. Indeed, these introductory sequences with Special Agent Chesty Short are very obviously metaphorical conversations about the show itself. None of the arguments really apply in any literal sense to the basement division operated by two federal agents toiling in obscurity. Instead, the arguments seem to apply to the show itself. “We open doors with the X-Files, which lead to other doors,” Scully explains, which could appear as a tagline on the back of the massive DVD box set collecting the full run of the show. The sequences with Short could be read in a number of ways. On the one hand, they play like conversations between Carter and his creations about the necessity or validity of continuing The X-Files. On the other hand, they also feel like they might have been informed by Carter’s own on-going negotiations with Fox. Carter’s long-standing professional relationship with Fox had experienced a setback earlier in the season, when Doug Herzog had unceremoniously cancelled Harsh Realm three episodes into its first season. That upset Carter. Mulder responds to Short in much the same way that Carter responded to Herzog, by pointing out that this guy has no idea about how things actually work; Carter had overseen the network’s most successful show for seven years, but was largely ignored and overlooked by an outsider who had been drafted in to shake things up. 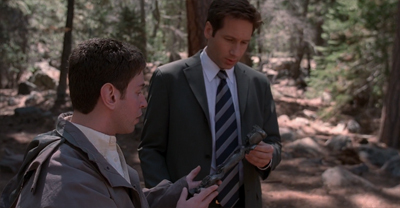 “You can’t really compare what we do to other departments in the Bureau,” Mulder advises Short, probably a statement that the production team on The X-Files and Harsh Realm had made several times. However, Carter was not the only potential roadblock on a possible eighth season. David Duchovny was still suing Fox over the syndication of The X-Files while Requiem was in production. Carter had made it clear that he would not produce an eighth season of the show without David Duchovny, to the point that Vince Gilligan admitted that the reality of an eighth season depended entirely on whether David Duchovny would say yes to it. Given Duchovny’s claim in interviews that it was “just about money”, there’s something pointed in having an auditor close the X-files. As it turned out, David Duchovny eventually settled with Fox in May 2000. He settled only three days before Requiem was broadcast, meaning that the eighth season of the show could finally press ahead after Requiem had finished production. “We were writing and filming the episode and not knowing whether or not we were coming back,” Carter recalls of the seventh season finalé. That is a lot of pressure on Requiem, an episode that would have been entirely different meaning had the lawsuit gone a different direction; even if not a single shot had changed. Requiem exists within a weird state of flux, its meaning not set until three days before it was broadcast. The X-Files was neither cancelled nor renewed – existing in a bizarro world where Fox was actually more eager to renew a show than most of the production team had been at the start of the season. “Elián González’ future is more certain,” Carter reflected in a suitably 2000-ish reference to young Cuban immigrant Elián González, whose story held national attention from late 1999 through to the middle of 2000. We didn’t know if David Duchovny would come back for Season 8 or would be leaving the show. We didn’t know if The X-Files would come back, for that matter. The episode needed to be satisfying in any event and also set up a movie. I believe that it worked in almost every way and for any eventuality, but here we are! On top of all that, Requiem also had to work as a forty-five-minute episode of television that could tell its own story on its own terms. It is worth pausing to reflect on the three possible futures that awaited The X-Files, the three different paths that might have lay ahead of the show at the time that Requiem finished production. The path ultimately chose was the path that led to an eighth season, where the disappearance of Mulder at the climax provided a clear thematic through line while allowing David Duchovny the opportunity to take a break from playing the role of Fox Mulder after seven long years. It was also entirely possible that the search for Mulder might have taken place on the big screen. Although The X-Files: Fight the Future had not set the box office alight upon its release in July 1998, the movie had been successful enough that everybody involved wanted to press ahead with the sequel. Carter reportedly received a phone call suggesting a second movie only a few weeks after Fight the Future opened. Initial speculation suggested that a sequel could be released as early as the summer of 2000. Carter’s initial plan for The X-Files had been to transition from a five-year run on television to a film franchise; perhaps not too dissimilar to the model proposed by the original Star Trek. Requiem might have served as a delayed opportunity to do just that. Carter confessed at the start of the seventh season, “We talk about [the next film] all the time. It’s just a matter of finding the opportune time to do it.” Of course, the production team were not as ready to segue from Requiem into a second film as they had been to transition from The End to Fight the Future. When asked about the possibility of a second movie after the eighth season had been greenlit, Carter was quite candid. “I really have to find the time to do it, and then find the right timing because we don’t know where the series is. I’m not looking forward to doing another movie during the series, certainly with Mulder and Scully on the show. That was very hard to do, and sometimes I still can’t believe that we did it.” The film was not in a position where it was ready to go, even if it seemed like a more viable idea than the eighth season for a while. This opens up the third possibility; that Requiem might have been the last episode of The X-Files produced… for a long time. After all, it is entirely possible that the eighth season might have fallen through and that plans for the feature film could have got stuck in development hell. There are any number of examples of shows that failed to transition from television to film. Remember all that hype around the possibility of a 24 movie or a Pushing Daisies feature film? It seems unlikely that a show as successful and well-loved as The X-Files would simply fade away. After all, the show is making a return to television after a very rocky final season and a critically (and commercially) disappointing film. It seems highly likely that The X-Files would have continued in some form or in some way. Then again, there is the persistent speculation that the issues with the final season and the second feature film may have contributed to the decision to greenlight the revival. In a way, Requiem serves as a great example of the immediacy of television as an artform, and the way that meaning can be imposed by factors external to the individual narrative. The X-Files is a very postmodern television show; its fascination with conspiracy culture also plays as a commentary on its own continuity. How much of The X-Files is actually there, and how much is created (or fueled) by discussion or exploration of it? The show does not stand on its own. To a certain extent, the audience is as complicit in creating narrative as the writers. The show has alluded to this both internally and externally. Episodes like Jose Chung’s “From Outer Space” and Bad Blood emphasise that there may not be a difference between perception and reality. Darin Morgan and Vince Gilligan repeatedly allude to the idea of continuity as a construct imposed upon reality by human consciousness as a way of making sense of the world. Gilligan is particularly fond of this, playing games with reality and intertextuality in stories as diverse as Unusual Suspects, Tithonus and X-Cops. However, The X-Files also demosntrates how influential elements beyond writing and directing can be when it comes to constructing narrative. Darin Morgan argued that the editing suite was “where you do your final rewrite.” Glen Morgan and James Wong would agree with him, particularly on the subject of Squeeze and … Tell Our Moms We Done Our Best. However, that is not the only example. Frank Spotnitz has conceded that special effects rendering on Tunguska was so tight that the two coasts literally saw slightly different versions of the episode. However, there are also other factors even beyond the version of the episode committed to tape that shape the narrative. The actual context of the broadcast, as distinct from the context of production, is one such factor. The X-Files had demonstrated this during the fourth season, when the decision to shuffle several episodes around in the broadcast order added a wealth of subtext. 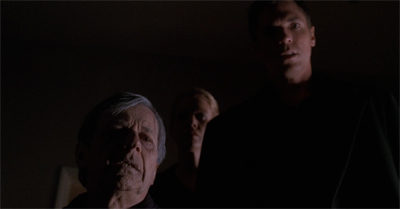 Positioning Never Again between Leonard Betts and Memento Mori radically altered fandom’s interpretation of the episode; writer Glen Morgan was far from pleased. Requiem is not just altered by the surrounding external narrative, it is infused with meaning by those elements. If David Duchovny had not settled with Fox, Requiem would be a very different episode. That is perfectly reasonable; after all, a lot of shows have final episodes that were not intended to be final episodes. Chris Carter certainly did not intend Inga Fossa or Camera Obscura to close out Harsh Realm. The difference with Requiem is that the script was written so as to consciously acknowledge (and shape itself to) whatever external narrative might develop. It was never an option, it was always the ending. I just did not inform the actors or the crew that Scully’s pregnancy was going to be in the script. I had planned this for months with Frank Spotnitz and only delivered the script pages to Kim Manners — the director — and to Gillian and Mitch Pileggi minutes before they performed the scene. I’m just paranoid! However, that final scene takes on a whole host of different meanings depending on what decision is made about the future of the show. Is it a conclusion or a cliffhanger? Even broadcast is not the only external factor to influence the interpretation of a particular episode. As much as episodes of television (like any work of art) must be discussed in the context in which they were produced and released, the context in which they are consumed must also influence discourse or debate. Signs and Wonders is radically different in the context of 2015 than it was in the context of 2000. As much as media might be anchored in its cultural moment, it is not entirely fixed. It is always filtered and interpreted through the lens of the reader. That is perhaps the most interesting element of the seventh season of The X-Files as a whole, for all its flaws. The seventh season of The X-Files exists both as a final season and a transitional season, depending on how a viewer chooses to examine it. There is a sense that the seventh season is reluctant to commit to the idea of resolution and closure; that the production team are unwilling to take all the necessary steps to offer a fully satisfying conclusion to a seven-year run. The seventh season is both the end and very pointedly not the end, often in the same instant. Although this is arguably just the same internal logic that allowed the mythology to balloon out of control, it does offer something interesting. The sixth season seemed to suggest that The X-Files could be immortal, populating shows with immortal characters and time loops. In contrast, the seventh season implies that The X-Files simply will never be entirely dead, populating the series with undead characters and zombies. The X-Files will never die, the seventh season seems to suggest, because the audience will never allow it to. This could easily be read as an anxiety about franchise fatigue. Certainly, scripts like Hollywood A.D. and Fight Club seem worried at the prospect of pushing the show past the point where it is creatively viable. At the same time, the seventh season also adds an emphasis on reality and illusion in episodes like The Amazing Maleeni, X-Cops and First Person Shooter. The seventh season also suggests that the show is in the process of aggressively reinterpretting and revising its own past in stories like Millennium or Orison, featuring quirky takes on established characters. The seventh season in general – and Requiem in particular – seems to suggest that The X-Files will never be entirely tidied away. Even if the show had not been picked up for an eighth season, the show would still be subject to constant revision and reviewing. After all, the first season of The X-Files had been released on DVD a few weeks before the broadcast of Requiem. It marked the first point at which an entire season of The X-Files had been readily available to a hungry fanbase. The advent of DVD completely changed the way that viewers engaged with television. Before DVD made it economical (and efficient) to collect entire seasons of television, only shows with the most devoted of fans released every episode on video. The X-Files had made several efforts to release its first season – whether through VHS or comic book adaptations. Neither approach actually made it all the way through the season. Putting an entire DVD box set in the hands of a viewer effectively meant they would have access to the show on their own terms forever. Television used to be ephemeral. An episode aired and, if you missed it, you might have one more shot to see it during a summer rerun. If you were lucky, the show might be sold into syndication and with constant vigilance you might see the episode in rerun, but that was your only chance. But now television seasons exist forever. Not the episodes, the seasons. The final state of a television show is a boxed DVD season set, about three hours to a disc, with no commercials to interrupt or pop-up IDs and promos to obscure the screen. You can pause it or watch it all in one sitting, if you get distracted and miss something, you can rewind and watch it again. The true state of a television series is, paradoxically, no longer on television. It is a set of DVDs that sits on your shelf in a box that looks like a book. And increasingly that’s how people watch them. Watching these shows has become like reading a novel. In a way, that undercuts or erodes the power of an ending. You can always reread your favourite novel, and discover new things each time. The words remain the same, but the meaning changes as you do. That is the beauty of Requiem and the seventh season, existing as both an ending and the denial of an ending. Neither Requiem nor the season around is entirely perfect, but there is a wealth of interesting and insightful material. It is an ending that is not an ending; not just because there was an eighth season and there might have been a movie, but because the show will exist forever and will always offer something new or intriguing to a larger cultural conversation. Of course, it helps that Requiem is just a really fantastic episode. It is undoubtedly the strongest mythology episode of the seventh season. It might be the strongest mythology episode since Patient X and The Red and the Black back in the fifth season. However, the real charm of Requiem is the episode’s elegance. The episode is very meticulously and carefully crafted, but not to the point that it ever feels overwhelming or overwritten. In many ways, Requiem is clearer and more concise than a lot of the mythology. Indeed, Carter’s script for Requiem is surprisingly candid about the show’s over-arching mythology. For all the smoke and mirrors employed in the first six seasons, Requiem is able to condense the basic structure of the mythology to a few pithy sentences. Short summarises, “Doors leading to… ‘a conspiracy of men who cooperated with alien beings to create human alien hybrids.’ So we could all become slaves of an alien invasion.” He also makes sure to bring up Scully’s own abduction experiences. For all the (admittedly deserved) flack that The X-Files gets for being obtuse or inaccessible or wilfully dense, Chris Carter’s script for Requiem is a surprisingly tight piece of work. The story has to be ambiguous enough that it could be read in a number of ways depending on what would happen between production and broadcast, but Carter is very good at explicitly signposting and marking important plot details ahead of time. Requiem very cleverly and consciously sets up Scully’s sterility so that the final scene has the most impact. It also helps that the motivations of those involved are rather transparent. The Alien Bounty Hunter is rounding up former abductees as part of a cover-up that also serves as a metaphor for the show tidying up its own loose ends. The Cigarette-Smoking Man hopes to recover a crashed ship so that he can jumpstart the conspiracy again. 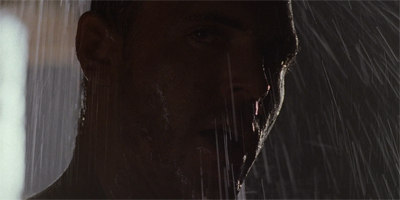 Alex Krycek is out to wreak vengeance upon those he blames for his fall from grace. These motivations are layered with meaningful allegorical subtext, but they are easier to follow than clones and hybrids. Carter keeps the basic plot of Requiem rather simple in terms of structure. The seventh season has an odd relation to the mythology of the show as a whole. Two Fathers and One Son promised to wrap up the colonisation plot, even if it was open-ended enough that the mythology could resurface in the final two years of the show. Mythology episodes after One Son tended to keep the actual conspiracy out of focus, creating the impression that there was still something going on; it just wasn’t on the same scale or with the same momentum. Biogenesis features a scene of the Cigarette-Smoking Man sitting in on a briefing that looks like it refers to colonisation. The Sixth Extinction II: Amor Fati has the Cigarette-Smoking Man plotting to make himself a hybrid. Closure suggests that the Cigarette-Smoking Man still has enough influence to know when Mulder and Scully are tracking him. En Ami suggests that the conspirators are still plotting to keep their own secrets. The conspiracy is not dead. Indeed, it feels almost like the Cigarette-Smoking Man in Requiem, stuck in a state of undeath. Requiem marks a return to the aesthetic of the first season, in a number of ways. It feels entirely appropriate. It feels strange to go back to the point where a single crashed UFO is a pretty massive deal, but that basic plot (and the use of lasers) harks back to Fallen Angel. It seems entirely appropriate, given that Fallen Angel really helped to solidify the sense that The X-Files would do well to lean into those weird alien stories as part of a single on-going narrative about government corruption. Requiem harks back to The Pilot. Mulder and Scully return to Belleflower. They are reunited with Billy Miles. 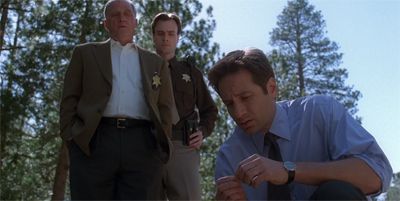 Mulder stands over the “X” that he spray painted on the road on that first adventure with Scully. Of course, as with a lot of the continuity of the seventh season, it is not quite right. Due to the production team’s move to Los Angeles, Belleflower looks a lot sunnier than it did seven years earlier. More than that, Mulder and Scully found themselves crowded out by characters who only arrived on the show after The Pilot. This is the past, but not as it was. Time is an important part of Requiem. In The Pilot, Mulder and Scully experienced nine minutes of missing time when they visited the community. In Requiem, time is not so much missing as distorted. It seems to fly by, metaphorically and literally. “I’ve never thought of myself as a cop but it’s been three years now,” Billy boasts. Scully greets him like a young relative all grown up. “You’re married, Billy.” The distortions around the crashed ship only accelerate the sense of time passage; watches spin out of control and bodies move as blurs. It is telling that the villains of the piece seem to want to arrest the development of The X-Files. The Alien Bounty Hunter is quietly erasing all evidence of alien activity in Belleflower, abducting former abductees and covering up a crash nearby. It is interesting to wonder about the particulars of what the Alien Bounty Hunter is doing. Is he effectively covering up the crash and tidying away loose ends while in Belleflower? Was he going to tidy up the abductions anyway in the wake of the conspiracy, and did he just happen to crash on his way there? Mama Scully’s back with a vengeance. The Alien Bounty Hunter perhaps embodies the death urges playing through the seventh season of The X-Files. The Alien Bounty Hunter represents closure. The Alien Bounty Hunter is effectively an external force who is tidying up the narrative, clearing the clutter. If the Alien Bounty Hunter had his way, everything would be wrapped up as if it simply never happened. The Alien Bounty Hunter is the death of The X-Files, the character who brings Mulder a full circle – taking him from a man who desperately searched for a sister abducted by aliens to an abductee himself. After all, Requiem is the perfect conclusion to Mulder’s arc. Mulder has spent seven years looking for proof, but seldom for the purpose of exposing it to the public. After all, it seems like the wider world of The X-Files is oblivious to the plot against mankind in Two Fathers and One Son. Mulder seems to want to prove it to himself, to validate the faith that he holds so absolutely. In a way, this idea bookends the seventh season. In The Sixth Extinction, Mulder gets to become alien himself; he is proof of his own beliefs. In Requiem, Mulder is abducted. In short, Requiem offers Mulder the real conclusion to his journey. Mulder gave his life to the X-files, and now he gets to become an X-file. One of the ironies of the second season was that Scully was abducted instead of Mulder, that Mulder was never able to experience that which he pursued with such vigour. Requiem allows Mulder to finally have the first-hand encounter with abduction that the character has clearly wanted for so long. David Duchovny does great work in those final scenes; he captures Mulder’s awe, relief and anxiety confronted by what he always wanted. Of course, Requiem never quite explains why the Alien Bounty Hunter wants Mulder and not Scully. 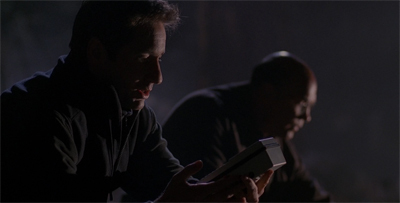 Scully suggests that it is because of the events of The Sixth Extinction II: Amor Fati, but it seems strange that the Alien Bounty Hunter would be so interested in characters like Billy Miles without wanted to take Scully back. While Scully might not have been hybridised like Mulder, she does exist as evidence of alien involvement on Earth. The Alien Bounty Hunter seems to be the literal embodiment of story necessity. He takes Mulder because Duchovny’s leaving. In conversation with Krycek and Marita, the Cigarette-Smoking Man returns to the idea of the alien as divine. “There’s no God, Marita,” he assures his colleague. “What we call God is only alien – an intelligence much greater than us.” The show has touched upon the intersection of the alien and the divine a great deal over the course of the seven seasons. However, the Cigarette-Smoking Man may not be talking literally. The Alien Bounty Hunter is perhaps a god in the machine, a deus ex machina existing to bring resolution to the show. If the Alien Bounty Hunter represents a graceful and tidy death for The X-Files, the Cigarette-Smoking Man stands (or sits) in opposition to that concept. He represents the urge to keep The X-Files alive at any possible cost, to keep the show ticking past the point of viability and sustainability. En Ami made it clear that the Cigarette-Smoking Man was an agent of the status quo, so dedicated to the preservation of the way things are that he would not allow a cure for cancer to escape into the public domain. Even here, he refuses to give up smoking as he sits dying. The Cigarette-Smoking Man recruits Marita and Krycek to help him restart the conspiracy, to restore his position of authority and reassert the status quo that drove the first six seasons of the show. “Recovery is all-important,” he advises his conspiracy of three. “It’s Roswell and Corona all over again – 50 years later. It’s our chance to rebuild the project.” The Cigarette-Smoking Man never explains why he’d want to rebuild a project built upon genocide and slavery; he doesn’t have to. The conspiracy imposes structure and order; it gives meaning. Reviving the mythology from its limbo state in the seventh season would give The X-Files purpose. It would allow the show some forward momentum and offer enough storytelling potential to sustain the show. After all, the eighth and ninth seasons do feature an attempt to revive the conspiracy that is not too dissimilar to what the Cigarette-Smoking Man is trying to do here. In a way, Requiem feels like a preemptive rebuttal of some of the more unfortunate creative choices lying ahead – proof that the mythology cannot simply be rebuilt and revived. The Bounty Hunter really appreciates the human invention of “the trunk”, doesn’t he? “Cancer Man is dying,” Marita explains. “His last wish is to rebuild his Project, to have us revive the Conspiracy.” Requiem presents the idea of resurrected mythology as terrifying and horrific. It is unnatural, an affront to nature. Mortal enemies Mulder and Krycek must ally to prevent this from happening. Even the alien ship that has crashed in Oregon is in the process of reengineering itself. “As we all stand here talking it’s rebuilding itself,” Marita advises the supporting characters who have assembled for Mulder’s impromptu last supper. Requiem is a fantastic piece of work. It is one of the show’s best season finalés and would likely have made for a very satisfying series finalé. It is a reminder of just how good Chris Carter can be when it comes to simple thematically-resonant storytelling, with clear set-up and pay-off. In many ways, Requiem is a “back to basics” mythology episode. There are certainly worse notes upon which to end the series. The seventh season finalé is one of the stronger episodes of what has been a turbulent year for the show around it. Of course, it turns out that Requiem is not so much a definite ending as a new beginning. It is the episode that sets in motion all the events that will drive the next two seasons of The X-Files. It is a point of transition for the show, a comma rather than a full stop. Even allowing for that, Requiem feels like a piece of punctuation. You really do a great job here. I hope the revival series is a success and folks discovery or rediscover the original series and, in doing so, find their way to your reviews. I mean, I think the reviews do good traffic as it is, even if people don’t generally leave comments. (If you’re reading this, feel free to leave a comment and say “hi!”) But, I mean, there is so much really great stuff out there about The X-Files that I’m really just glad that some people feel I have something to contribute to discussion around the show. What I mean is that you’ve developed a tremendous resource for the show. Requiem, finally! Thank you Darren for all these in-depth reviews and linking them back to the zeitgeist and entertainment industry context of the time when it aired. The seventh season has such a peculiar feeling to it, much more playful at times but also at other times like a twilight, dark and spiritual and post-apocalyptic of sorts. Certainly it feels like a last season. Characters reach what really feels like the end of a journey: Mulder reaches his truth, Scully gets a child, Skinner asserts himself as a believer, the devil CSM is sent to hell…tragic endings mostly, but then Carter is not one to give much happiness in resolutions. Season 8, despite its qualities, doesn’t fit with that “novelistic” quality, if that ever was the objective of the myth and characters arc in the X-Files. You don’t add a main character in the last chapter of your book. Season 8 should have been the start of something new. If anything, season 8 raises plenty of questions that season 9 attempts to answer to. So even season 8 and its nice closing shot for the two main characters is even less of an ending than season 7 — which is sad, as season 8 was the opportunity for an even deeper re-start than what season 8 achieved ultimately. Actually instead of moving in a different direction, seasons 8-9 launch a similar mythology to the early seasons, just with these Supersoldiers instead of the Syndicate and with more religious subtext. We end up in the same position, colonization is looming and we underlings try to seek “the truth” in the midst of conflicts we hardly even understand. For all the story direction reasons, for the expectations and intent of essentially all the crew during most of season 7, for the lack of significant additions to the mythology in what came after, Requiem for me could have been a good series finale (FWIW, my old-ish review: http://www.eatthecorn.com/eps/7X22.htm). Besides, it doesn’t even have a “to be continued” at the end! @etc1013 I found this site through you actually and your site is phenomenal as well. I really like season 8 and think I would argue it is the best overall season since season 4. But as much as I love that season, I think you’re right, that Requiem is a better finale for the show despite coming at the end of what was probably the worst season to date. But if we are going to play that game, I have always thought Redux II would have been a very interesting finale. 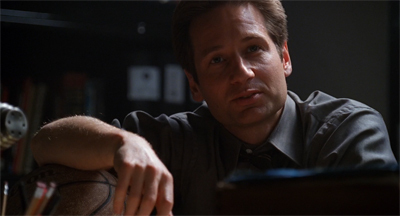 It gives the characters you mention roughly the same conclusions except for Mulder. I agree with you regarding season eight, although I’ve always found season four to be wildly uneven. I’d actually rank five higher than four or eight. First, I wholeheartedly endorse Eat the Corn. I could not have done this project without them. Check them out, they are fantastic. I agree with the need to break away from the mythology, although I like the simplicity of the eighth season mythology. The fact that the super soldiers are more generic than the syndicate allows for more focus on the idea that Mulder and Scully really need to call it a day. I think it becomes a problem when the ninth season takes that fairly thin foundation and tries to build upon it. If the show had abandoned aliens and colonisation completely, I think the ninth season would be better remembered. There’s a lot of love for season 8 and I can understand why — back to basics, no more “XF lite”, some good loners, tightly plotted season-long arc, good performances all around. But on the other hand there are many things that bother me about the mythology: the whole drama around the baby, the cartoonish Supersoldiers, the hidden brain disease, the resurrection and cure of Mulder. I wish they had made the bolder decision to let go of the Mulder & Scully characters completely, or have them in the background from episode 1, or have all of Duchovny’s episode in the start, and really launch something with Doggett and Reyes from the get go, focusing on that mythology of “evil incarnate” they seemed to be getting to. Instead, Mulder still gets to be on the cover of season 9’s DVD and BluRay, larger than Doggett or Reyes. You mention Twin Peaks: that’s what season 8 felt like: Mulder is Laura Palmer, absent but in everyone’s mind. Then season 9 made it worse in terms of lack of character resolution. Less than the obscure mythology plot points, it’s that refusal to let go of the past to the point that it felt like beating a zombie horse that tarnished the show’s legacy. Really, season 7 is a good place to stop, and let it take a rest, even if it means losing some good monsters-of-the-week — but then you could have said that for stopping at any point, who knows if Gilligan or Maeda or whoever might not have written an excellent stand-alone in season 10 or 11 or 12? Plot-wise, though, a deep change or losing much of the weight of the past or a complete stop was necessary. And I think we will have things to talk about about these exact aspects of Carter’s writing come the revival series. And once again, Doug Herzog made his “impact” on yet another cult classic series. The first time that I can recall was his mid 90’s stint at Comedy Central, inheriting Mystery Science Theater 3000. Unfortunately, the relationship between Best Brains and CC was already dissolving by the time Herzog was hired, and he cited “low ratings” as to why he or his management team decided to canceled the series. Even though, everyone figured the increasing bad blood between the two groups seemed to be the real reason. I didn’t know Herzog went to Fox after that time, and apparently had his effect on Chris Carter, so that’s series number two (or three, if you count Harsh Realm). The third one would be South Park, as Herzog eventually returned to Comedy Central in 2005-2006, and he directly influenced the Cartoon Wars two-parter, specifically Part 2. Much of Part 2’s drama about Kyle pleading the Fox executive to air the Family Guy version of Mohammed mirrored Trey Parker and Matt Stone doing the same with Herzog, even in dialogue with “do the right thing, Doug.” And Herzog declined and the rest is history. And these days, he runs Viacom’s Entertainment and Music division, which is a depressing aspect, but that’s television executive life for you. Anyway, commenting to add a little extra context to that part. As for the episode itself, it was my first X-Files episode or the first one I can remember viewing. The imagery or the epic nature of the ending sucked me in, and I became a very casual fan afterward. I am a speculative fiction fan, and while I found the X-Files and its mythology to be too daunting to watch every week, I did respect it for the most part. Until I realized how Carter has major issues with endings generally, but he’s not alone as the past 5 years have indicated with other series. In fairness to Carter, writing a series finale is hard. Writing a good one is even harder. It wasn’t until the Lone Gunmen’s spinoff series that I finally paid more attention, despite its many problems which you excellently demonstrated. And I occasionally tried to watch Season 9 in 2002, but my expectations were low and that was for the best. I’ve recently came upon your site for your Star Trek: Enterprise reviews, and then decided to finally read your X-Files versions with rising interest. They’re truly helping me know the ins and outs of the series, as a proper recap should. Keep up the good work. And, yes, I agree how “Requiem” should have been the series finale, as while it may be depressing about Mulder being abducted, he also finally got what he wanted, as you noted. Your reviews also note well how problematic Mulder or, really, the series’ approach toward him can be, especially after reading your “Never Again” review. No wonder I’m taking a shine to Doggett and Reyes — it’s hard to dislike the latter if she’s willing to make whale sounds to help a pregnant Scully — and they would have been fine if they had the proper time to develop and if the series or the producers didn’t overtly pine for Mulder and Duchovny (and the then-soon-departing Scully and Anderson). At the same time, I do acknowledge how Duchovny/Anderson proved to be lightning in a bottle and good live-action chemistry is very rare and incredibly difficult to replace. And we’ll see how true that still is with the upcoming revival series. Off I go to read your “The Truth” review. I didn’t realise Herzog had a history of such things. The general consensus around him seemed to be that he was relatively good at managing a smaller network, but had not idea how to programme at a large one. Thanks for the links! It’s funny you should say that about endings. Gilligan said pretty much the same thing in his own assessment of the show’s final season. I’ll hopefully be finishing my Enterprise reviews early-ish next year. Provisionally around April. If I could only watch one episode of the X-Files ever again, this would be it. It hits all the right notes, gives me so perfectly what I want from each character, sums up the series to this point beautifully and manages to move forward at the same time. It’s a great little episode. And, I’d argue the perfect place to leave the show. And I say that loving the eighth season. Oh, I agree. I would have been happy for Requiem to be the end of the show, with a return in some form in the future. You’re right. That’s a fantastic closing scene, and Anderson knocks it out of the park, but Pileggi is so good as well.